I don't know whether it's the grey clouds and perpetual rain outside, or the fact that my house is simply freezing, but I have started to revisit February's A/W 2011 collections to decide on which looks to recreate next season. The vibrant colour blocking, straw hats and breezy white linen dresses that are currently ubiquitous in my wardrobe are going to be exchanged soon for a new palette, changing silhouettes and the emulation of different eras. And, not to be forgotten, the A/W collections usually include lust-worthy fabrics such as wool, cashmere, silk, leather and fur (faux, please), that just feel so much more sumptuous and glamorous than plain cotton/linen summer dresses. Oh how I love the anticipation of a coming season, when everything seems new, fresh and inspiring, and the shops are not saturated to boredom point with the season's main trends. First up: Red Red Red! The colour that will be everywhere next season is a deep cerise, seen on everything from coats (Alberta Ferretti) to cocktail dresses (Lanvin, of course). As this happens to be my favourite colour, the one that suits my dark hair/pale skin complexion the best, the colour of the poppies on the desk in front of me and the colour of my favourite winter coat, I couldn't be happier. Red is the very opposite to those virginal white dresses we've been wearing all summer; it's synonymous with love, passion, anger, lust and wrath... nothing better to liven up these dreary July days. And as for the other colours? Think jewels, darling. Think Sapphires, Emeralds and Jacinths, as well as Garnets, Opals and Onyxes. Use Lanvin's A/W 2011 show as your starting point (actually, this should always happen), and grab your cocktail dress, work those supersize jewels and storm your colourful way through Autumn's puddles. Secondly: Back to the Sixties, baby! As dedicated followers of fashion that I assume you, dear reader, are, in the past few months you will have worn palazzo pants, floppy hats, wedges, flared jumpsuits and other 70's paraphernalia to death. Having indulged in the outre luxury of this era- the silky fabrics, the expressive silhouette and the bohemian excess of all those palazzo pants and floppy hats- next season is set to become a whole lot cooler. (Pun definitely intended.) Yes, the Mods are back with a vengeance. Shifts will be shorter, shoes will be more mannish (opt for a chunky brogue or Chelsea boot for the new season's edge now) and eye-liner will definitely be heavier. About a week ago in Italy- more of that to come!- I picked up the August edition of Italian Vogue that features one of the best shoots I've ever seen... I love, love, love it! Sara Maino really evokes the defiant spirit of the Mods, with Jean Shrimpton hair, heavily kholed eyes and boys decked out in Fred Perry; all photographed on what looks like Brighton beach. Shot in black and white, the 60s silhouettes of shift dresses, pea coats, mannish tailoring and skinny legs are perfectly balanced with the edge of the modern clothes; this is Mary Quant redone by Christopher Bailey. Next up: Mixin' in up! The coming season is all about the details, the textures, the fabrics. Fur collars need to be mixed with tweed, sequins with leather. And then the fur with the leather and the sequins with the tweed. Big knits, embroidered capes and belted waistcoats should be thrown together with aplomb, hopefully (maybe not those last three examples) creating that je ne sais quoi that makes the perfect outfit. This trend is about the layering of fabrics- bouclé wool, tweed, fur, suede, leather- clashing prints, like at Jonathan Saunders, and mixing up your outfit to make it that much more interesting. A simple take on the trend is to take a leather (panelled, if you're nervous) pencil skirt or pair of shorts and pairing it with a chunky, oversized knit. Alternatively you can pair a slinky sequinned dress with a large parka for a nod to the 90's grunge look, or a some cropped tweed trousers with a belted fur waistcoat. Be brave! 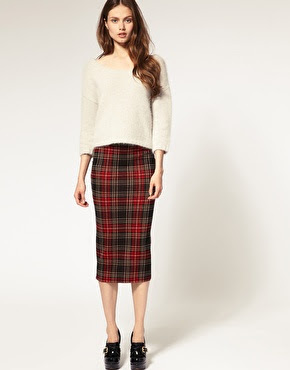 And lastly: New season, new skirts. Unless you're working the 60's shift this coming season, hemlines for everything else are on the way down. Despite being an 18 year old girl who should be welded to her mini, I'm in love with this trend! At the moment my burgundy pleated midi never really leaves my side; whenever it does my maxi dresses are the pieces that usually take its place. 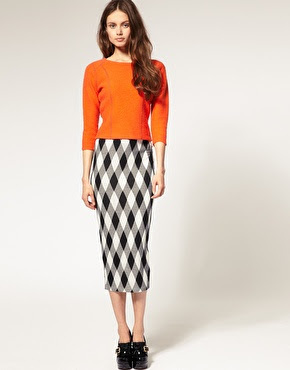 The below-the-knee pencil skirt is my own personal challenge, however; usually dowdy or the haunt of middle aged office workers, they can be seen next season in every colour, print and fabric under the sun. With a chunky knit on the top-half (you may have guessed at this point that I'm a little obsessed with big knits...) and Spats or other mannish brogues on your feet, I'm envisioning them as very cool indeed- with not a water cooler in sight.